He is the man behind Nona Dollar Baby Film. Ben Cowper: My name is Ben Cowper, and I’m a cinematographer and editor with a background in experimental narrative film. I am currently working as a media education specialist for a university in the United States. SKSM: When did you make Nona? Can you tell me a little about the production? How much did it cost? How long did it take to film it? 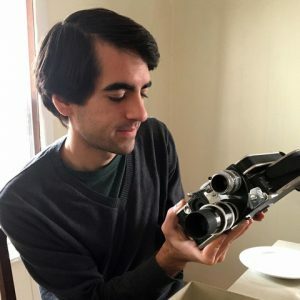 Ben Cowper: Nona was my senior thesis film in college, I started production in late summer of 2015 and wrapped principal photography in March of 2016. It took about 5 months to film, and typically I had a crew of between two and twelve people. The film cost about $300 to make. The measly budget covered food, transportation, a couple costumes, and a dollar for King. None of the cast and crew were paid, and I owe them so much for sticking with it to the end. SKSM: How come you picked Nona to develop into a movie? What is it in the story that you like so much? Ben Cowper: My selection process went something like this: Step one, read the Wikipedia pages for all the stories King was offering, eliminate the obvious ones that don’t interest me. 2. Read all the remaining stories and rank them based on 4 factors; feasibility, cost, number of actors, and quality of the story. I ended up with three options: Nona, Morning Deliveries, and something else I don’t remember now. I ended up choosing Nona because it seemed like it would adapt well into a film, and would be the most fun to make. Ben Cowper: Sometime in the end of 2014 I was strongly considering making a horror film for my thesis project. I had just picked up a book of short stories by King and really wanted to adapt 1408. I quickly learned some so-called “professionals” beat me to it, but a friend suggested I check out King’s dollar baby program. It was then that I started the aforementioned selection process. Ben Cowper: One evening we had just finished a long shoot and were packing up to leave. I had initially planned to load up the mini-cooper (one of the cars featured in the film) with all the equipment, and bring the actors and crew back on a bus. Unfortunately, I learned that the bus had stopped running because of an impending snowstorm. Instead, I loaded the car with equipment and packed in both actors and two crew members. The AD, co-DP, and I proceeded to hitchhike back to the college. This was somewhat ironic if you’ve read Nona, because much of the story is structured around the characters murdering friendly drivers who pick them up hitchhiking. We decided, at the very least, that the experience would be great background research for the film. The snow was starting to pick up as the three of us moved uphill, laden by the remaining equipment. We stuck our thumbs out to multiple passing cars with no success. The walk was about 6 miles, and would be tolerable in the event no one stopped. Fortunately, an Audi driving in the opposite direction pulled a u-turn in the middle of the road and stopped to pick us up. The interior of the car was washed with pulsating LED lighting, and the driver, Vince, was blasting bad hip-hop. We thanked him, decided not to explain the plot of the film, and rode back to the school. It was nearly impossible to talk to him because of the music, but we managed to get in a few words. His destination was roughly 7 miles in the opposite direction, and to this day I’m still not sure why he picked us up in a snowstorm. Ben Cowper: It would be cool if King changed his mind in the future, but for now I’m ok with the festival only restriction. I was able to screen Nona as a part of my thesis presentation, and that event was enough of a spectacle to satisfy me. In the meantime, film festivals provide a good route for those seeking a venue for their work. Ben Cowper: My thesis advisors, both seasoned filmmakers, provided me with regular critiques of the film. They tore apart edits, praised my cinematography, and offered suggestions for refining the film. In the end they unanimously passed me, stating “the piece was a rich cinematic viewing experience.” Around 200 people attended my final screening, and many of them also praised my work. Ben Cowper: Yes, I’ve just submitted it to the third annual King on Screen festival in Buenos Aires, Argentina. Ben Cowper: I’ve been a long time fan of films based on King’s work, but I only began reading his work shortly before making Nona. I place his films and novels in very different categories. I have enjoyed most of what I’ve read, and of course I love The Shining and The Green Mile, but a lot of films based on his work are really garbage. Ben Cowper: Nothing more personal than communication with his assistant and an Instagram follow. I would assume he’s seen it by now, seeing as the contract requires a copy be sent to his residence. I like to imagine he watched it one night, shrugged, and went to bed. No, I have not received any feedback from King personally. Ben Cowper: I’d maybe consider an abstract adaptation of my second choice story, Morning Deliveries, but at the moment it’s not really on my radar. While I enjoyed the process, it was a little too restrictive with the distribution rights. I’d rather make work I own. Ben Cowper: I’ve been making short experimental films and editing a couple docs and personal projects. I have plans to get back into narrative soon, but the specifics of that project are a secret at the moment. Stoker (2013) – Chan-wook Park’s film about death, family, and the evil humans are capable of. One of the most inspirational in terms of its editing, structure, and color palette. If you’ve already seen the film, try rewatching it with a specific focus on camera movement and the way in which it drives the storytelling. Suspiria (1977) – A wild take on the horror genre, Argento paints his actors in bright primary colors and dresses his sets with geometric patterns. This film is worth a watch for a multitude of reasons including its lighting design, bizarre atmosphere, and original score by Goblin. Paris, Texas (1984) – This film rides on Harry Dean Stanton’s understated performance. His character behaves in the manner of a real person, not an actor playing a part. This keeps the viewer more engaged and allows them entry into the world of the film. In making Nona, I worked almost exclusively with non-actors, conveying to them a similar message of embodying the subtleties of a person other than yourself.